This is a big week for the Hubble Space Telescope. Twenty-five years ago, on April 25, 1990, the Hubble Space Telescope was released into orbit from the Space Shuttle Discovery. Astronomers from around the world are taking stock of the amazing achievements of Hubble over the past 25 years: observations that continually challenge our view of our own Solar System, discoveries of extrasolar planetary systems, a more complete view of star and planet formation, understanding how galaxies evolve from just after the Big Bang to the present day, putting constraints on the nature of the enigmatic dark matter, and even helping to discover that the majority of the mass-energy in the universe is in the form of a mysterious repulsive force known as dark energy. To top it all off, thanks in large part to five servicing missions, Hubble is a more powerful telescope today than at any point in its history. Astronomers are not only celebrating Hubble’s iconic achievements of the past, they are looking forward to what Hubble can accomplish over the next five years. This anniversary week at the Space Telescope Science Institute (STScI) in Baltimore, Md, a symposium is being held called Hubble 2020: Building on 25 Years of Discovery. STScI is the science operations center of the Hubble Space Telescope, so it is a fitting location for astronomers to gather to discuss the past and the future of Hubble science. For the adventurous out there who would like to test and strengthen their astronomy acumen, watch the astronomy symposium online, where astronomers discuss science results with other astronomers. For other events celebrating Hubble’s 25th anniversary, you can click here. Part of the conversation happening around the past, present, and future science of Hubble focuses on Hubble’s exploration of the deep universe. As it so happens, April 2015 is also the month where the imaging and processing of the Hubble Frontier Fields data are half-way complete. Of course, astronomers will be pouring over the images for years to come — the science results from the Frontier Fields are just beginning. Shown in the images below are the first three completely imaged Frontier Fields galaxy clusters (Abell 2744, MACS J0416, MACS J0717) and their respective neighboring parallel fields. 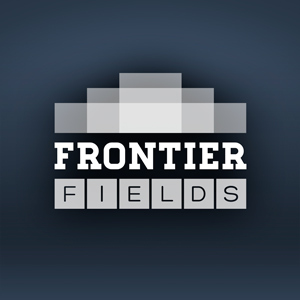 Shown here are the first three completed Frontier Fields galaxy clusters and their associated parallel fields. 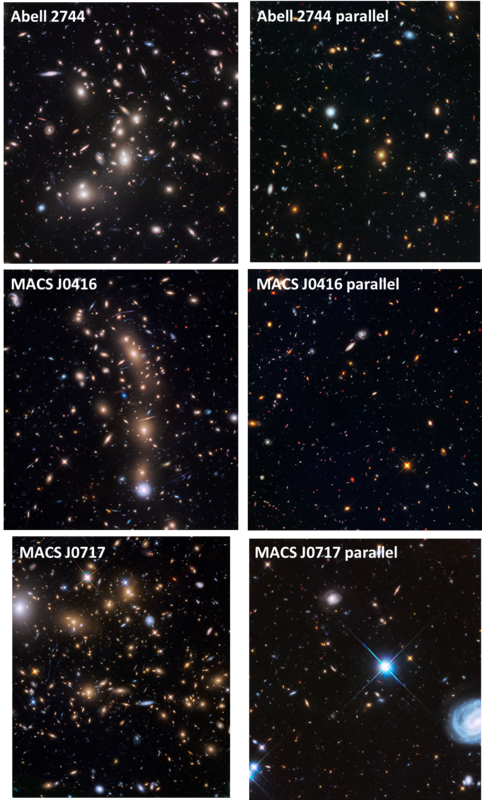 Labeled, from the top, are galaxy cluster Abell 2744, the neighboring Abell 2744 parallel field, galaxy cluster MACS J0416, the neighboring MACS J0416 parallel field, galaxy cluster MACS J0717, and the neighboring MACS J0717 parallel field. The MACS J0717 galaxy cluster image and its associated parallel field are still being processed, so we expect new versions of these images shortly. Astronomers are already looking forward to the future of deep-field science. While much of the discussion this week is about Hubble, astronomers generally acknowledge that to truly build off of Hubble’s discoveries, we need the next-generation Great Observatory, the James Webb Space Telescope (JWST). JWST is scheduled to launch in the fall of 2018. I think it goes without saying that the participants of the Hubble 2020 symposium are incredibly excited at the prospect of these two behemoths of science — these machines of discovery — exploring the universe at the same time. Reblogged this on Santa Sede: Il Mondo visto da Roma – Holy See: The World Seen From Rome – Santa Sede: El mundo visto desde Roma – Santa Sé: O mundo visto de Roma – Saint-Siège: Le monde vu de Rome – Heiliger Stuhl: Die Welt von Rom aus gesehen – Stolica Apostolska: Świat widziany z Rzymu.